A British Columbia Waterfowl Management Success Story." Sitting in my blind this past winter I have watched a truly unique British Columbia wildlife spectacle, the return of the Trumpeter Swans to the Comox Valley on Vancouver Island. I can remember when, only twenty-five years ago, that the Comox Valley was host to only three of these magnificent birds. They were rare and endangered at that time, less than 10,000 in their total world population, scarce like the 'Spotted Owl' is today in our old growth forests. At that time, as a Director of the B.C. Wildlife Federation, I was asked by the Canadian Wildlife Service to help them with a most serious problem. These particular swans had discovered the fall seed corn planted on the Courtenay River dike flats farm fields and, like meticulous sewing machines, were marching up and down the rows gorging themselves on the sprouting corn. Because I drove by the fields each morning and afternoon, my task was to fire a flare pistol over the heads of the swans. The flare, on most occasions, was ample to startle the birds and send them back to the river estuary. Once broken of this feeding habit they finally moved to other 'greener' valley fields to winter. There was one tragedy for this wintering family. One misty February weekend morning one bird was found where it had collided with the power lines along the dike road, dying instantly when it was electrocuted. But, this one bird has served an even greater purpose these past twenty-five years. It was mounted by the Canadian Wildlife Service and presented to schools in the Valley. It still visits various school libraries now missing a few feathers where many hundreds, even thousands of students have gently stroked the creamy white feathers . It still remains a beautiful educational example of this largest of our North American waterfowl. I like to be poetic and think that from these two came the many. But, I know that my singular efforts were only minor in the total well being of these striking birds. The species was on the brink of extinction but, it had not yet reached that state when there were too few to find others to mate and to reproduce. I recall even earlier, in the late 1950's, that the B.C. Wildlife Federation initiated a $500 reward for information leading to the conviction of anyone who killed one of these rare birds. It was highly successful for it created the early vital and effective publicity which provided necessary increased protection. 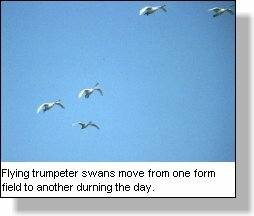 Fortunately, like the Canada goose, the Trumpeter Swan has adapted well to a rural and urban mix of wintering habitat, so much so that when it increased it's population above 10,000, it was moved from the 'endangered' wildlife category to the 'threatened' category. In the late 1980's, with an even greater increase, it was moved again to the 'vulnerable' category. Today it has a Pacific Flyway population of over 14,000 and a world population of over 30,000. 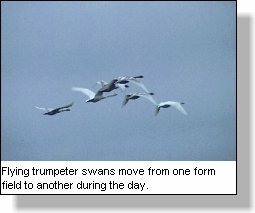 Trumpeter Swans are the largest waterfowl found in North America. They have an average weight of 11-13 kilos ( 28 - 33 lbs) and mate for life when they are three years or older. 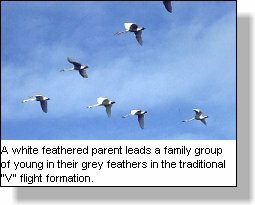 Adult birds tend to be a cream white in color while young of the year, signets, tend to have grey colored feathers. Their name comes from the distinct 'trumpet' call of the adults. In my blind I have been fortunate to watch their incredible flights from field to field and I remain amazed at how their large black paddle webbed feet act as landing gear when they glide and splash into various ponds and flooded fields. As they fly overhead the wind can be heard whistling through their powerful flight feathers in a sound unlike any other in the waterfowl world. 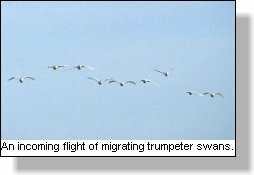 The Pacific coast provides wintering locations for about 14,000 Trumpeter Swans. These locations are scattered throughout the Northwest states and southwestern B.C. The Comox Valley on Vancouver Island has the greatest concentration and winters about 3000 birds. The concentration of birds is not without its problems and, as I mentioned earlier, the birds often wreck havoc on farmlands. The Comox Valley Waterfowl Project, a program sponsored by Duck Unlimited with funding from the Canadian Wildlife Service has three objectives according to Ducks Unlimited. These objectives; public communications & education, a 'scare' program, and, planting of cover crops, are coordinated by a Waterfowl Project Coordinator. It is worthy of note that funding for most CWS wetland waterfowl projects comes from waterfowler purchase of federal government Migratory Game Bird Hunting Permits and Donations by Duck Unlimited. Communication and Education goals; To produce a project newsletter to reduce the gap between agriculture and the public. As well to support the Comox Valley Annual Swan Festival to generate public awareness of problems between swans and landowner. The festival objective is to set up a wildlife legacy fund. 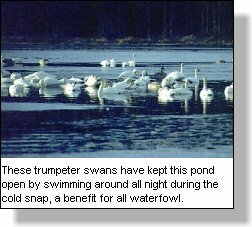 aimed at Trumpeter swan management initiatives. To produce an educational colouring book which will be available at the festival - free. Cover crop promotion: Trumpeter swans have selective palates when feeding on grasses. They like the succulent new growth of perennial rye grasses and orchard grass, these are the local dairy pasture grasses. The program promotes cover cropping of annual rye grasses. Cooperator landowners are given $25 per acre to plant this cover but it is not a compensation measure. Currently 35 farmer/landowners participate in the program, 11 of whom are cooperators with a total of 500 acres in this annual cover crop. Scare tactics. With the new cover crops available there are places for the Trumpeters to go and they are able to be chased from places the farmers wish to protect. Black flags are used as a scarecrow because it is an obstruction in the field which makes the swans uneasy. Strings of multi -coloured pennants and sections of red and silver flash tape are also used. They all work on the effect they have on the trumpeter's landing, take off, and general uneasiness. Coordinated management, farmer land-owner support, and public awareness have done much to promote the tenuous state of these gigantic birds in recent years. The sight of open fields along the Island Highway, white with their majesty, is a sign of the success of these three goals. Now, from Late October through March, as I watch from my blind, I am constantly reminded of the concentrated efforts of many to enhance one more of British Columbia's special wildlife species.